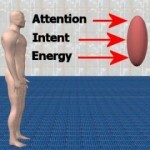 This gallery presents examples of energy being focused somewhere in a human body or from a human body onto an object. It is common to hear energy described as “being put on something”. When a human being is “putting their energy on something”, either their body or some part of their body will be focused on “the something”.